Flint knapping and fire lighting – a guided tour of the camp will immerse you in the Magdalenian way of life. On a reconstructed cave wall, come and create prehistoric drawings and discover the techniques used for this art. An entertaining time for all! Learn to use a spear thrower, the Magdalenian weapon of choice. You will learn how it works and above all discover how the ‘Homo sapiens’ who lived in France 14 000 years ago fed themselves. Become a great hunter, just like our ancestors! The workshop reproduces the archaeological soil of a dig and illuminates the archaeological process and methods. 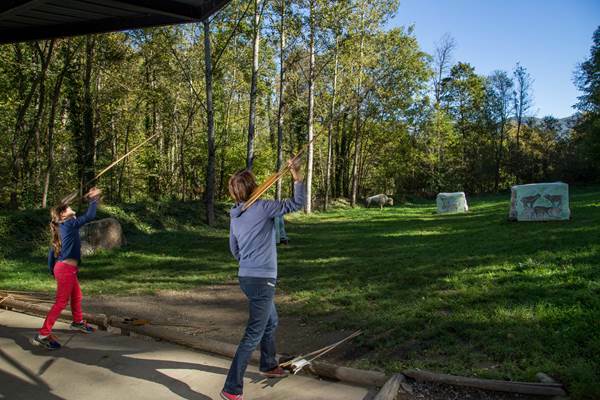 Embark on a hunt for traces of the past and recreate the camp activities! These workshops are available independently. Three audio trails are on offer in the labyrinth so you can ‘hear’ the Magdalenian world. Enter into the mysterious world of sound, music and rhythm! This trail offers a series of paw prints of the emblematic animals of prehistory in order to get to know them better. 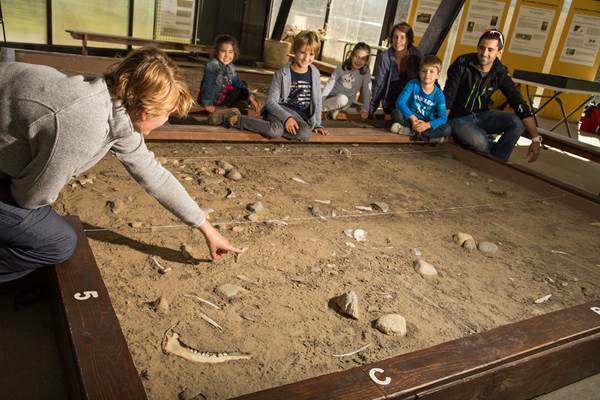 Play the tracker, observe the prints and discover the Magdalenian fauna! This panoramic fresco tells the story of a prehistoric hunting day from dawn to dusk. Share a day of reindeer hunting with the Magdalenians. Follow the rock path, alongside pools and waterfalls…. Discover the traces left by man and animal on an environment of water and rocks!